Last Sunday I just wanted something SIMPLE. I’d had a super long, exhausting week at work and even after resting up over the weekend I just found the prospect of cooking daunting. I didn’t want to assemble 20 ingredients or spend an hour preparing different elements of a meal. I wanted quick and tasty and healthy. Also, I wanted ricotta, which is a weird craving but I went with it and threw together a delicious spinach, tomato, and ricotta frittata (bonus breakfast leftovers), then I added some more protein with this “dynamite” chicken. Oh well…it was worth it in the end, because the flavors on this chicken will knock your socks off. It’s really got some tangy bite, which was a nice complement to the more soothing, mellow frittata. Also, it was super easy, which is always a win in my book. 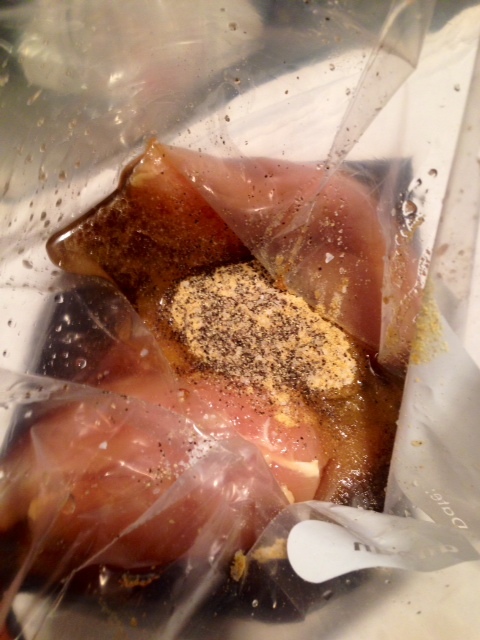 Throw the chicken into a big ziploc bag or a tupperware container. Add all the marinade ingredients and seal the bag with a little bit of air in it, then smoosh and shake it all around to coat the chicken. Marinate in the refrigerator for an hour, a couple hours, or even overnight. When you’re ready to cook the chicken, heat the grill to medium-high, then place the chicken on the grill. Grill for 4-5 minutes on each side, until the chicken juices run clear. Or, you may go out to your patio to find that your grill doesn’t want to turn on, and have to punt. In which case you can cook them on the stovetop with a little olive oil for 8-9 minutes on each side. Yeah, that happened. These were juicy and moist and tangy, with some bite and some sweet. The chicken was also just as good a couple days later as leftovers, which isn’t always the case…I find that chicken breasts sometimes get kind of dry and harder as leftovers. The leftovers would be great in a salad, as sandwich filling, throwing into pasta, or eaten by themselves. Put all the ingredients in a big ziploc bag or tupperware container. Marinate one hour or up to overnight. Grill 4-5 minutes on each side (or saute 8-9 minutes on each side) and enjoy!